Tania Willard, Only Available Light, from the series Only Available Light, 2016. 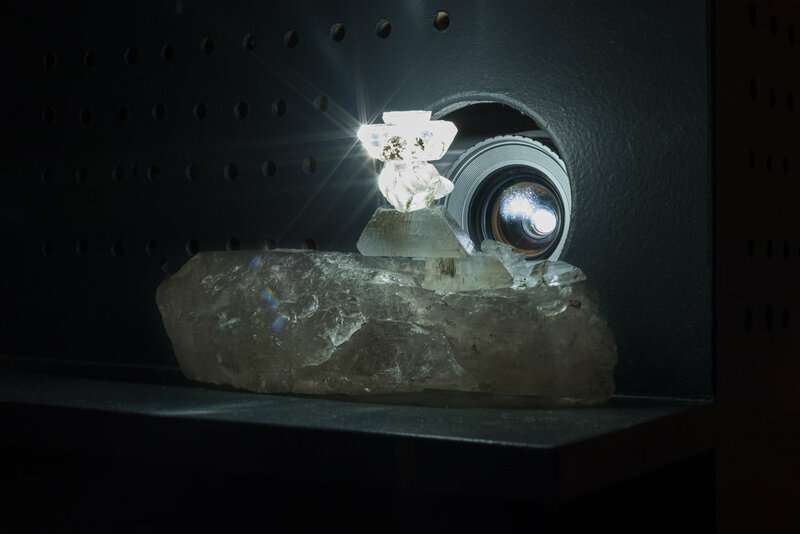 Archival film (Harlan I. Smith, The Shuswap Indians of British Columbia, 1928), projector, selenite crystals and photons. Film 8:44. Original composition by Leela Gilday. Photo: Toni Hafkenscheid. Language revitalization and reclamation is central to the practices of a generation of Native Artists moving between urban and rural communities. Artist Tania Willard and poet Natalie Diaz will have a public discussion about the motivation and struggles behind learning to speak Secwepémcstin (Secwépemculecw/Interior Salish, British Columbia, Canada) and Mojave (Arizona, USA) respectively—learning the languages of their parents as a second language and as a subject that informs their different disciplines. The discussion will focus on the value of inherent meaning, and knowledge contained in distinct languages. Presented in partnership with Endangered Languages Alliance (Brooklyn), an organization providing opportunities for education and outreach around the preservation of the estimated 800 languages spoken in New York. Tania Willard is from the Secwépemc Nation, Interior British Columbia. She works within the shifting ideas of contemporary and traditional as it relates to Indigenous cultural arts and production. Her curatorial projects include Beat Nation: Art Hip Hop and Aboriginal Culture, The Vancouver Art Gallery with Kathleen Ritter, Unceded Territories: Lawrence Paul Yuxweluptun at the Museum of Anthropology with Karen Duffek, Nanitch: Historical BC photography, and Landmarks2017/Repéres2017. Her art practice centres around BUSH gallery, a site of land-based experimental and conceptual Indigenous art futurity. Natalie Diaz was born and raised in the Fort Mojave Indian Village in Needles, California, on the banks of the Colorado River. She is Mojave and an enrolled member of the Gila River Indian Tribe. Her first poetry collection, When My Brother Was an Aztec, was published by Copper Canyon Press in 2012. She is a Lannan Literary Fellow and a Native Arts Council Foundation Artist Fellow. She was awarded a Bread Loaf Fellowship, the Holmes National Poetry Prize, a Hodder Fellowship, and a PEN/Civitella Ranieri Foundation Residency, as well as being awarded a US Artists Ford Fellowship. Diaz teaches at the Arizona State University Creative Writing MFA program. She splits her time between the east coast and Mohave Valley, Arizona, where she works to revitalize the Mojave language. The Endangered Language Alliance (ELA) is an independent non-profit based in New York City and the only organization in the world focused on the immense linguistic diversity of urban areas. Many of the New York area’s estimated 800 languages are highly endangered; for many, New York is a major center. ELA documents and describes underdescribed and endangered languages, educating a larger public and collaborating with communities. This event takes place in conjunction with #callresponse (March 23 - May 5, 2018).